T2 Tank-system e-cig mods are among the top selling variants of e-cigs across the world. Amidst the hundreds, if not thousands of brand and products competing for market share in the T2 segment, the Halo Triton from has consistently stood out as one of the most favored products. But is the product actually worth all the hype? This Halo Triton Tank System review has the answer for you. The Halo Triton isn’t that different from products like the SR72 from Mig Vapor or the Apollo Oracle in terms of the specs. However, because of the aesthetically pleasing color options, convenient accessories and multiple mod options, the Halo Triton is easily a great choice for the vaping beginners or beginner upgraders. The Halo Triton tank is one of the best T2 tank system e-cigs in the market. While it looks similar to competing products by other brands in the market, its unique color and design elements, as well as its amazing compatibility with other popular Halo products does make it a stand out e-cig mod in the T2 category. The Triton Tank Kit comes with two Clearomizer tanks. The tank is built to hold 2.4 ml juice and is available in seven transparent/translucent color options. I chose the Blue Triton Tank to match my Midnight Blue battery. A common problem with many starter T2 tank is the tendency to leak when they are full. However, Triton seems to have come up with a good way to prevent flavor leaks in its tanks. I filled them to full capacity to check for leakage, but the liquid didn’t leak at all. The atomizer with the 2.2–2.4 ohm coil also works perfectly well even after my seventh replacement with different flavors, but in case you want to replace them too, you can get them at very reasonable prices from Halo. While the Halo Triton may not appeal much to bigger mod users, it is indeed an ideal kit for beginners or middle of the ground users. 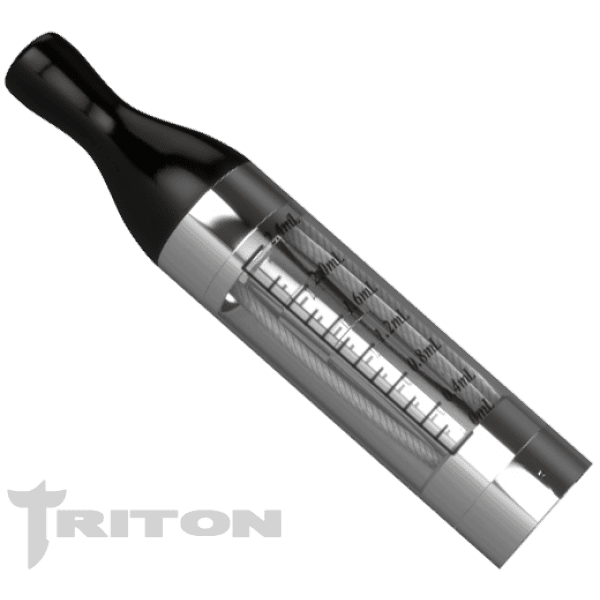 The Triton Tank is undoubtedly among the best in its class. This Halo Triton review section includes the most notable features of the product. For more specification details, do take a peek at the official website. ​The color options for the Triton are simply amazing. From plain no-nonsense colors to the Navy Iridescence, buyers can choose among a large variety of colors for their batteries and cone. ​Users of the Halo G6 will surely be enticed to buy the Triton because of its wonderful compatibility with the existing G6 kits. ​Having tried many vaping products in the T2 segment, I can say that the Halo Triton offers a fairly satisfactory throat hit, compared to competing products. ​A lot of vaping products are often supplied in cheap paper+plastic packages or simple magnetic boxes. But the Triton’s strong plastic box case isn't only attractive but useful for secure storage or gift giving. The contents of the Halo Triton Starter Kit are packed neatly inside a spacious and beautiful spring loaded black box with a Halo logo written in silver color. The box is not just beautiful, but pretty tough as well, and can be easily carried in a handbag or backpack. Many of my friends have stuck with Halo because of their wonderful customer service. They have an amazing 60-day warranty on the batteries and a 90-day warranty on the charging system. I placed an online order for the Halo Triton Starter Kit around mid-October and received it at my address four days later. ​Users of other vaping brands may not like the fact that Halo Triton is non-compatible with the products of most other brands. Thus, from the charger to the batteries, Halo’s products and accessories are mostly useless with other products. At just under $65, the Halo Triton isn’t the most budget-friendly T2 tank-system. Similar offers from the Apollo start under $40, while customers can get even cheaper models for around $25. However, the Halo Triton is still affordable when compared to Cigavette’s VIP Starter Kit or The Inferno Vape Pen. ​In functional terms, charging a Halo Triton battery with the wall charger isn’t the best experience. While wire-based adapters are vulnerable to wear and tear, we can't ignore their convenience. By contrast, the Halo Triton's adapter, forces you to hang the batteries on the wall charger while charging. I feel this probably isn't the best way to charge. It would have been better if Halo provided a wire-based charger. Halo Triton is a great product for beginners and beginner-upgraders. While, the Halo Triton is certainly not the cheapest brand in the T2 tank segment, it is also not the most expensive - It's a middle-priced entry level e-cig. Yet, at under $65, the Halo Triton does offer a good value for money through its quality products and amazing customer service. 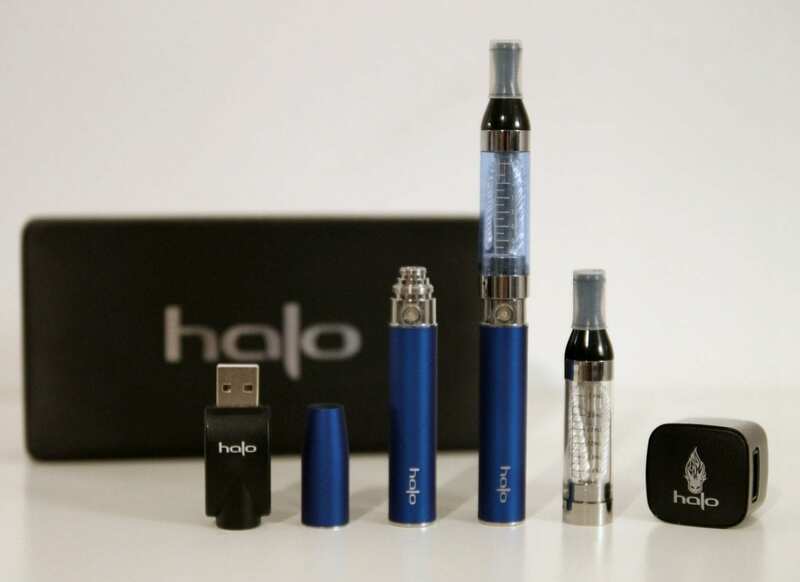 If you find the Starter Kit somewhat pricey, you may want to try out their Halo Triton Single Kit. It's priced at just under $25. Aside from that Halo has also launched the new and upgraded Halo Triton II. Here is the official video for the Halo Triton Single Kit.